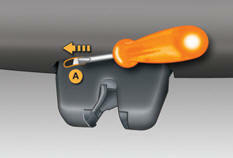 System allowing the mechanical unlocking of the boot in the event of a battery or central locking system malfunction. Move the latch to the left. If the fault persists after closing again, the boot will remain locked.